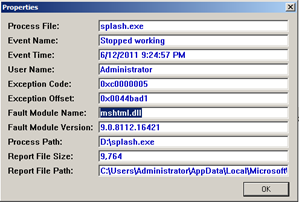 Setting up user profile synchronization seems to be one of the most tricky tasks in SharePoint 2010. I experienced this myself just recently. The problem was that I started with the farm configuration wizard right after I first installed SharePoint 2010. This basically sets up everything for you, including a default user profile synchronization service and My Site host. Starting from there resulted in lots of issues. I could get SharePoint to work properly with my own newly created User Synchronization Service. Even after properly setting the service connectors. So after a lot of head scratching I just started all over with two fresh web applications. Follow it to the letter! So hopefully this will help you get you on your way! A couple days ago I found these handy guides via the Microsoft forums. These documents are very handy to have when teaching people Dynamics CRM2011. I read some really great news a couple of days ago concerning the announcements made at WPC 2011. Microsoft Dynamics CRM currently has more than 30000 customers and more than 2 million users worldwide. For me it wasn’t such a big surprise though..Dynamics CRM really is a great product to work with. It’s easy to use, it has a great ROI and a low TCO. What more do you want from a CRM system? - Improved disaster recovery with in-region replication to further protect data and offer higher levels of business continuity in the event of a disaster. - Micro-blogging: Status updates and notifications regarding business events and actions, bringing simple experiences for users similar to Facebook and Twitter. - Activity feeds: Configurable real-time notifications on all important relationships and significant business events via a blended view of micro-blog posts and all interactions for a person, customer or sales opportunity. - Conversations: Users will be able to post questions, observations, suggestions and status updates, allowing them to collaborate quickly and efficiently, locate information or expertise and gather feedback from others. - Automated activity updates: Microsoft Dynamics CRM will be able to post information directly to the Activity Feed based on configurable event rules, e.g. a sales opportunity is closed. Users can subscribe to or “follow” these Activity Feeds, and consume them in a variety of ways. - Windows Phone 7 mobile application: With a new Windows Phone 7 mobile app, users will be able to view their Activity Feeds, while away from the office. To close this post, in the first half of 2012, Dynamics CRM will be supported on other browsers than Internet Explorer like for example Safari, FireFox and Chrome. This is great news for Mac users and the people who really like working in non IE browsers. Looks like Microsoft has some big plans for Dynamics CRM and I’m really looking forward to these updates! 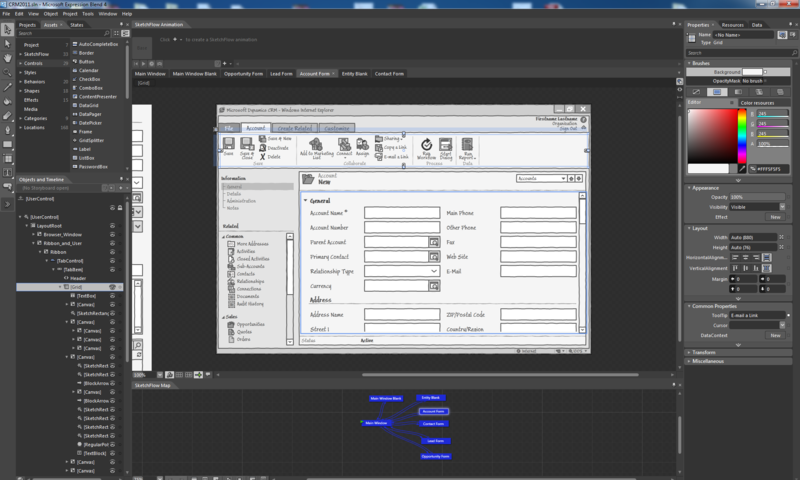 Over the weekend I started working on a new virtual image that I could use for CRM 2011 experimenting. For the OS I chose Windows Server 2008 R2 x64. Once the OS and SQL Server 2008 were installed I launched the Windows updates. Obviously there were a lot of updates that needed to be installed so this took a while. I also chose to install the latest service pack for Windows Server (SP1) and Internet Explorer 9. IE9 is of course supported by Dynamics CRM 2011 (and CRM4 since rollup 13). 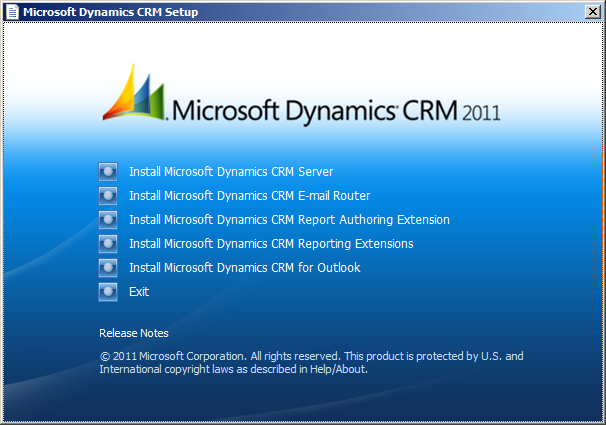 Once all the preparations were done I could finally start with the installation of Dynamics CRM 2011. 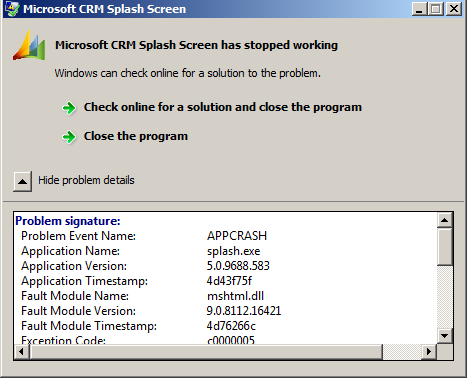 I loaded the .ISO file and there came the splash screen of Dynamics CRM 2011. 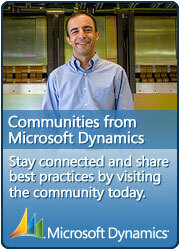 I had read about this problem before on the Microsoft Dynamics CRM community forums. There I couldn’t present a better solution because at that time I didn’t know exactly what was going on. Now I had the problem myself and I just had to find a better workaround! 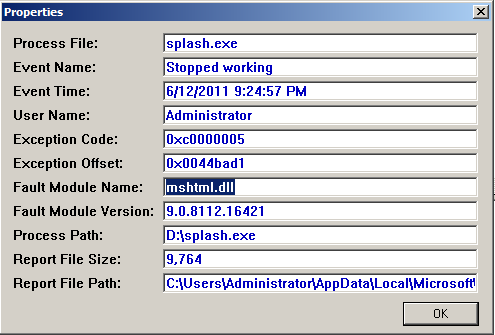 Immediately I noticed from the error that something was wrong with “mshtml.dll”. It was clear for me that it had something to do with Internet Explorer 9 which I had just installed. Why exactly I can’t say..but Internet Explorer had to go, temporarily (because I really like IE9 and it works perfectly with Dynamics CRM 2011). So I went to Control Panel and went looking for “Internet Explorer 9”. It’s not in the default list of installed programs. You need to click on “View installed updates” in the left menu. Remove this for now and restart the system. Now you will have the previous version of Internet Explorer again. Now when I run the splash screen again, the install continues like it should be. For me this solves the problem in a decent way. Once the install is done I can just install Internet Explorer 9 again. Of course this is a workaround..I‘ll make sure the bug information is sent to Microsoft. I’m involved in a lot of Dynamics CRM data migration/integration projects. I know how much time it takes to analyse, clean up and import the data into a Dynamics CRM system. If you’ve done this in the past, then you know it can get complicated very quickly. Definitely if you have a lot of relationships. With this version of Dynamics CRM I was pleased to see that you get some extra help in preparing your data fore the import. 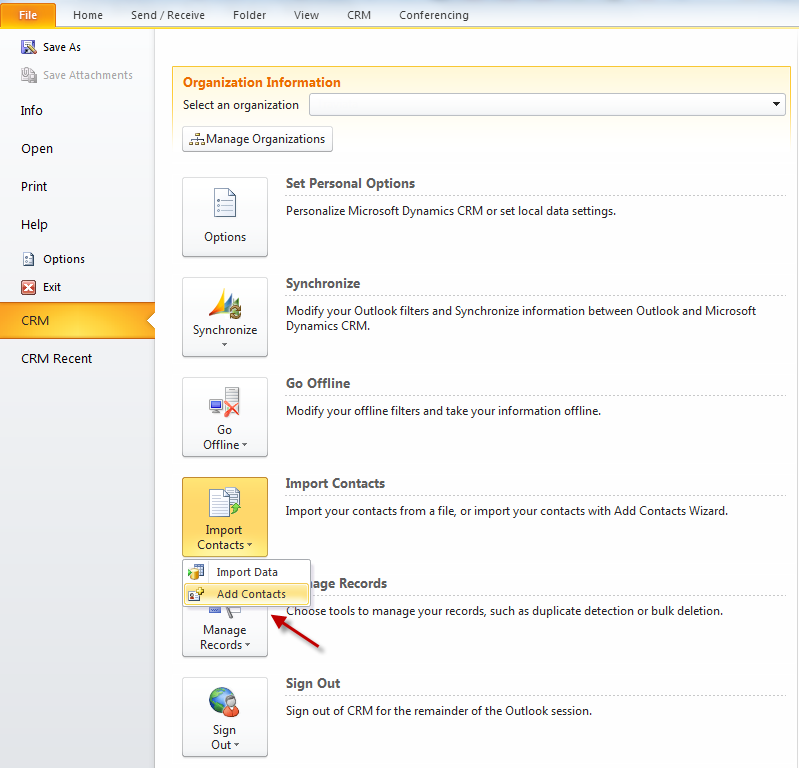 With CRM 2011 you can generate templates via the system that will help you with the preparation of your data. These import templates are in an XML format which you can open with Excel. 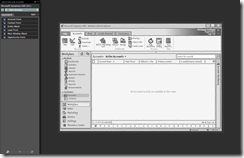 Generating the templates is done via the CRM 2011 system and it’s very easy. You can generate it per entity or from a more central location. Let’s say I want to retrieve the template for the account entity. I just navigate to the accounts view and click on “Import Data” from the ribbon. In the dropdown list, select “Download Template for Import”. If you want, you can also retrieve the templates via the settings area. To do this click on “Data Management” in the left hand navigation. From this view select “Templates for Data Import”. This will open a window with a dropdown where you can select an entity from. Once you have made your selection, click on the download button to download the template. Once this is downloaded, you will notice that it’s an XML file. But no worries, you can open it in Microsoft Excel. At least when you have unblocked the file. This is just a security measure to prevent you from opening unwanted dangerous files. 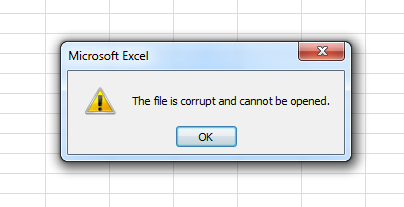 If you don’t unblock the file, you will be get the error message “The file is corrupt and cannot be opened”. 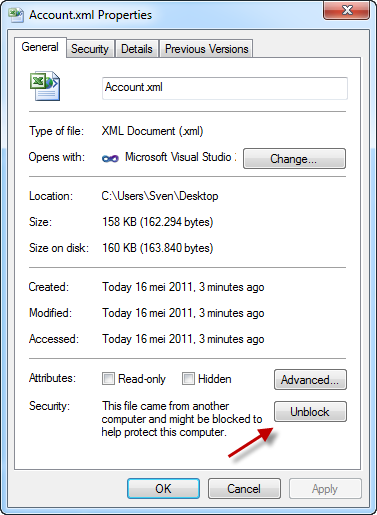 To unblock the file, right click on the XML file and open the properties. 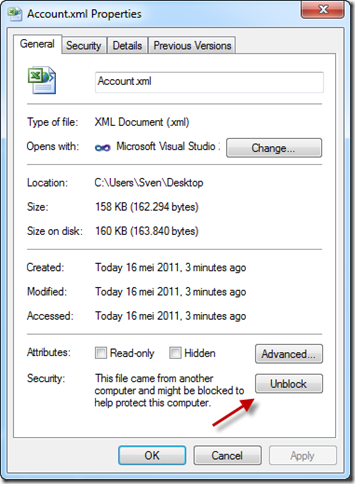 Here you will see a button to unblock the file. - The required fields are marked in bold. 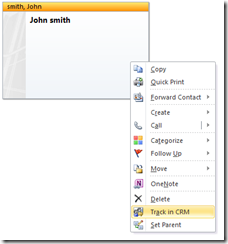 - The column headers are the same as the display names of your CRM 2011 fields in your entity. 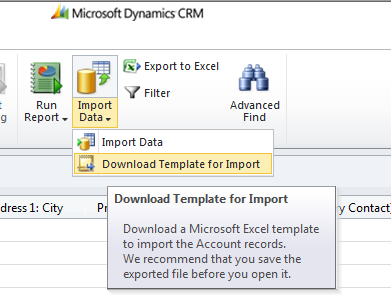 Because of this, CRM 2011 will automatically map your data to the correct fields during the data import. - All the fields from your entity are in here, so you don’t need to open your entity all the time and copy over the fields. - If you click on the header you will see the description of the field. - Option set fields contain a dropdown so you can easily select your value. No incorrect spelling and all the possible values are right there in Excel. All that is left to do is to fill in the Import template and import it using CRM 2011. In the past when I was mainly working on custom software development projects, I liked to wireframe my application before actually diving into the code or IDE. To create these mockups I used tools like Balsamiq. Creating mockups can save you a lot of time. Definitely when you need to start from the ground up. You don’t have to worry too much about functionality or the esthetical part of the application. The client will not start complaining that he/she doesn’t like that certain tone of grey that you have used or that a certain button doesn’t behave exactly like it should. With Dynamics CRM this is of course a different story. First of all, you get already the base functionality straight of the box. Second, there will probably not be a lot of discussion possible concerning the GUI of the application itself. Normally you stick to what you get out of the box. However I see some added value in wire framing, prototyping or sketching your CRM2011 application. I will come back to that later on. I went looking for some decent approach to start prototyping Dynamics CRM applications and my search brought me to mSketch from Magnetism. 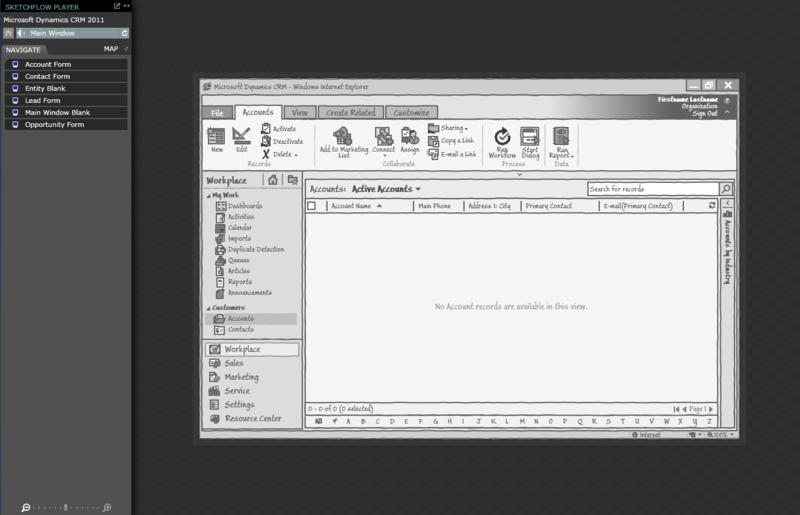 mSketch is a collection of stencils that can be used to create mockups of CRM2011 applications. All the work is done with Expression Blend 4 SketchFlow. If you don’t have that much experience with this tool, I would really advice you to check it out. This great tool was introduced by Microsoft to shorten the bridge between developer and designer creating WPF or Silverlight applications. The company Magnetism was also no stranger to me because I had been following their blog posts and work on Twitter for a while. With mSketch you get a solution that you can open with Expression Blend. 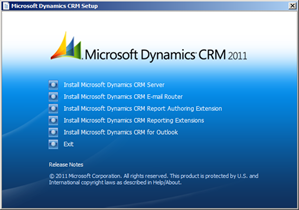 This solution contains the CRM2011 forms predefined by Magnetism. These forms you can then use to create your own implementation. A nice to have would be to have an installer that would install the stencils as a project type in Expression Blend. Ok, so the stencils gave me a great head start. All I had to do now was to copy one of the forms in my own solution and start the customization of my custom CRM2011 application. Using sketchflow functionality you can define the paths that your application needs to follow. 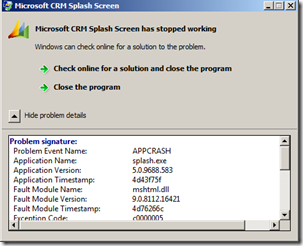 Once completed I just had to push F5 and I had a running prototype of my custom CRM2011 application. Now to come back to a previous discussion, what are the benefits of prototyping your CRM2011 application? Here are some of the benefits I see with prototyping a CRM2011 applications. 1) You can use Expression Blend 4 and the mSketch stencils together with a client to rapidly workout a draft of their CRM2011 application. 2) The client can easily play around with the mockup using the sketchFlow preview created by Expression Blend. This can be deployed to IIS. 3) You don’t need to have CRM2011 installed from the beginning, everything is done in Expression Blend (or IIS for the testing). In cost and performance requirements this makes a big difference. 4) You can limit the discussions concerning the placement of fields, the ribbon, the operations or scripts on a form. You can explain that this is just a draft, a prototype. The full functionality will come later. 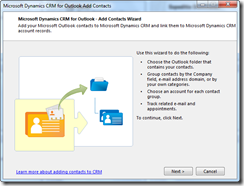 In this short blog post I would like to discuss the different methods to import your Outlook contacts into Dynamics CRM2011. 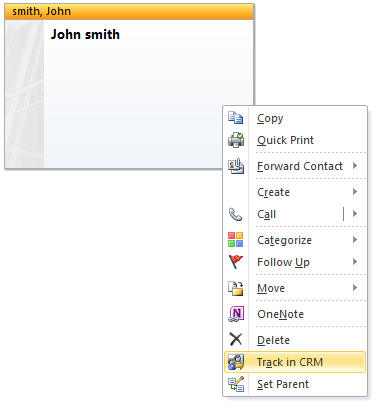 Tracking a contact in CRM 2011 means that you will select your individual contacts and select “Track in CRM” from the context menu. If this operation is completed you will have the same contact created in Dynamics CRM. The benefits are that your contacts are automatically kept in sync. 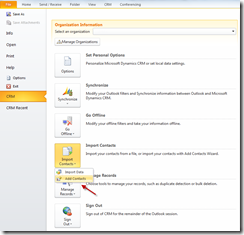 For instance when you change a property of that contact in CRM, this property will be synchronized with the contact in Outlook. 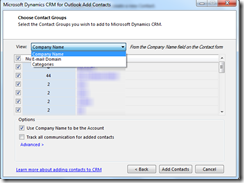 If you delete the contact in Dynamics CRM, it will stay available in Outlook. 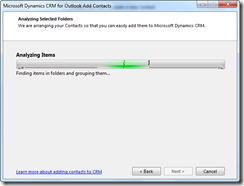 If you delete the contact in Outlook, it will stay in Dynamics CRM. 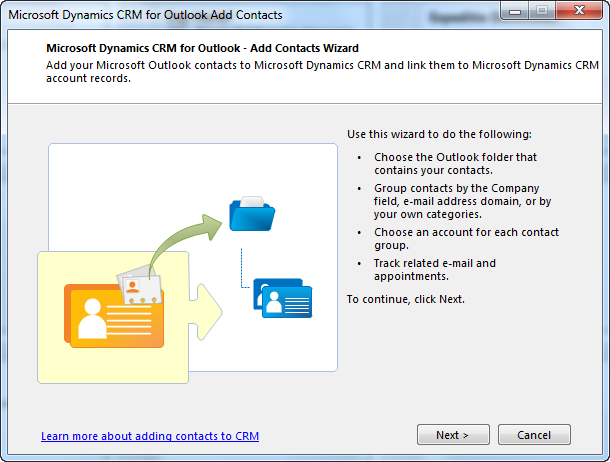 If you want to be able to manage all your contacts in Dynamics CRM, then you can use the “Add contacts” wizard available in the Outlook client. 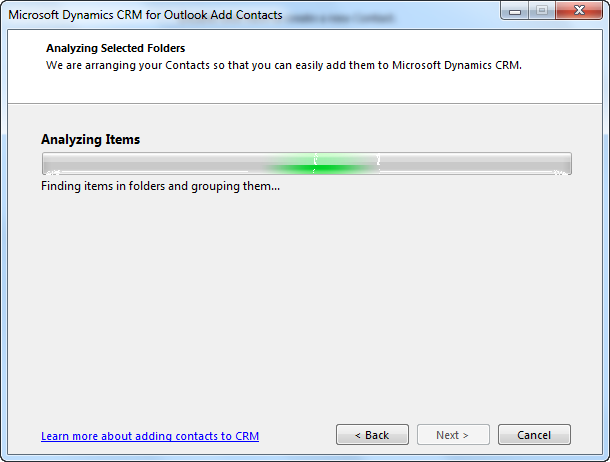 This is a convenient way of moving all your contacts to Dynamics CRM2011. I would advice to set up decent duplicate detection rules to prevent duplicate records. Here you can also configure whether or not an account should be created for the companies linked to the contact. Another nice feature is that you can decide here whether or not future communication with these contacts should be synchronized to Dynamics CRM. 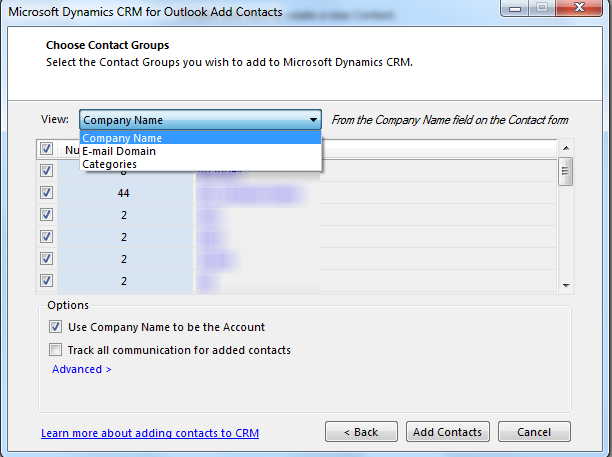 6) Finally you can click on the “Add Contacts” button to add your contacts to Dynamics CRM2011.